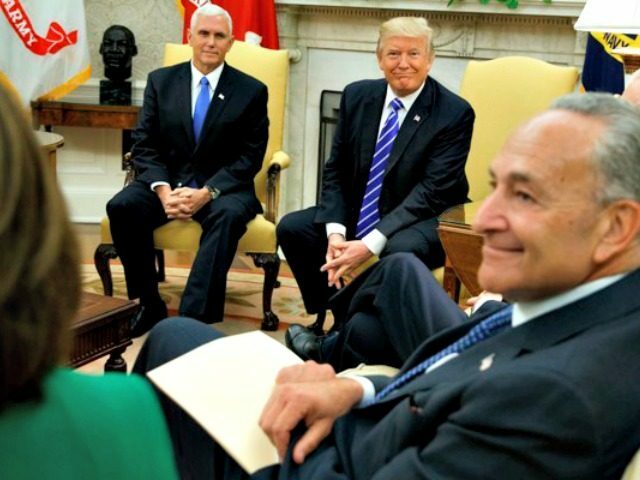 Conservative groups and lawmakers are furious at President Trump for his shocking decision to make a deal with House Minority Leader Nancy Pelosi (D-CA) and Senate Minority Leader Chuck Schumer (D-NY) to raise the debt ceiling. Trump overruled congressional Republicans and his own advisers Wednesday when he agreed with Schumer and Pelosi in an Oval Office meeting to raise the debt ceiling and finance the government for three months — killing the chance Republicans had to use Hurricane Harvey funding to push for a much longer extension. Conservative lawmakers responded negatively, with Axios’s Jonathan Swan reporting that Republicans were angry and in a state of shock. “Democrats got more done in a single Oval Office visit in one afternoon than the congressional Republicans have achieved all year,” one GOP operative told the outlet. “He fucked us,” said one GOP official. Now conservative Tea Party groups are also expressing their anger, saying they didn’t work tirelessly to help Trump get elected for him to cut deals with two of the most unpopular Democrats among conservatives. David Bozell, the president of For America, told the New York Times that it was a moment that could derail his presidency. “Trump spent some of his own political capital today,” he said, adding that the base would be keeping a very close eye on what Trump does in the next few months. The move by Trump is also likely to cement a long-standing fear among conservative activists that, no matter how many branches of government they control, or how big the majority, Republican politicians always cave to Democrats. Part of this may be because of Trump’s ideological fluidity. Before committing to politics, Trump has moved between Democratic and Republican causes, and even his most ardent supporters would not call him a deep-rooted conservative. In fact, part of his electability was his ability to move away from traditionally non-negotiable tenets of the conservative agenda, such as free trade and infrastructure spending. But while conservative and Tea Party groups accepted Trump’s various heresies, tempted in part by Trump’s “Drain the Swamp” rhetoric, doing deals with Democrats may be a step too far for them. “This is straight out of the swamp, and I call on President Trump to say something publicly about this. [It] is a swamp deal and will not be tolerated,” FreedomWorks CEO Adam Brandon said, according to Lifezette. The deal with Democrats came a day after Attorney General Jeff Sessions announced the repeal of the Obama-era Deferred Action for Childhood Arrivals (DACA) program — only for Trump hours later to declare that he wanted Congress to “legalize DACA” and would “revisit this issue” if Congress did not.